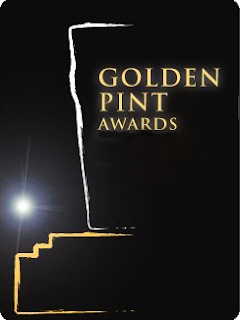 Every year UK based beer bloggers Mark Dredge and Andy Mogg put out the cry for beer bloggers to produce their "Golden Pint Awards". Basically it's a celebration of best beers had during the year by people who know the most about beer, or at least think they do! Best Australian Draught Beer - Fixation IPA I thought about this category for ages this year. I had beers that blew me away (Boatrocker Wild Apricot springs to mind) but Fixation is a beer that I really struggle to pass up on tap. It's got a classic hop combo; Simcoe, Mosaic, Citra & Amarillo & is one of the best balanced IPA's in the country. It's almost always fresh as Tom & his team push education to the venues they sell to. It's so good that this has become the most likely IPA to find on tap in Melbourne! 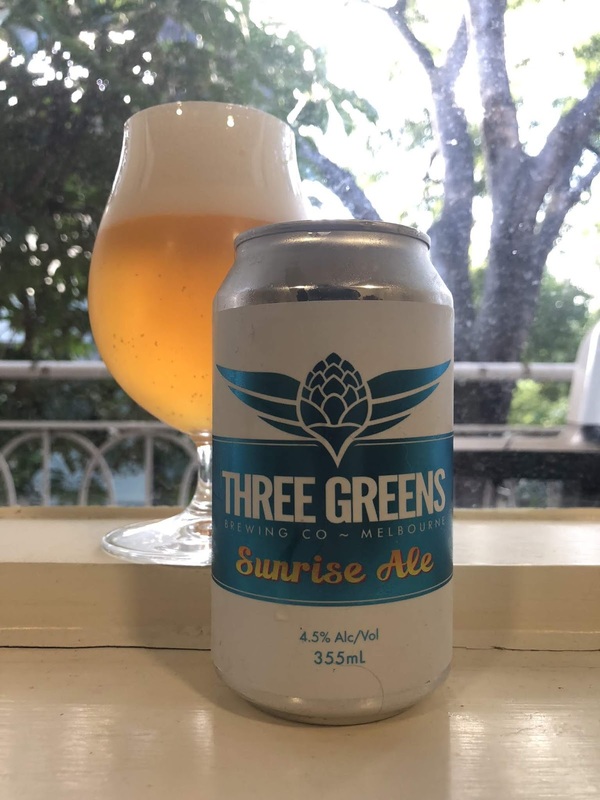 One of the best NEIPAs in Australia comes from a surprising source – tucked away in the industrial town of Brendale, about half an hour north of Brisbane. The brewery itself is a rough and tumble affair, where you drink next to bags of malt and bright tanks. The beer is a cracking example of how to do a New England IPA, with a properly murky haze, low bitterness and wonderful juiciness from a Falconer’s Flight/Citra/Mosaic hop combo. Drank on a hot Queensland day, it was hard to go past this for my favourite Aussie tap beer of the year. 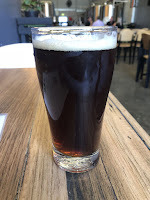 Best Australian Bottled Beer - Holgate Beelzebub's Jewels (2013) This beer absolutely blew me away when I had it as part of a blind Quadrupel tasting in March, 2018. It finished top of the pack with all the usual suspects (Westvleteren, Rochefort etc.). If that doesn't tell you how good this beer was tasting I don't know what will! Wildflower went from strength to strength in 2018, with their St series of beers being some of the real highlights. The pick of the bunch was their St Henry – a barrel aged wild ale that was refermented on 230kg of New South Wales apricots. The result is huge fresh apricot flavours, with punchy, deep tartness and a complex funky yeast profile. It’s a beautiful beer fresh…and it should only get better over time. Best Australian Canned Beer - Mornington Squid Supremacy The biggest of the Squid's to be released in 2018 (Colossal Squid has now taken that crown. At 8% this is an Imperial NEIPA, that I believe to be the best produced in Australia to date. There is none of the astringency than characterizes so many Australian examples and is instead almost creamy with heaps of pineapple, apricot and mango flavours coming through. The shine started to wear off for me personally when it came to Modus’s hoppy releases; although they undoubtably produce quality hop-driven beers, it was difficult to shell out premium prices for what felt like minor variations on hazy IPAs every couple of months. I’m glad they restored all my faith in their prowess by releasing this beautiful, Victoria only can of milk stout for Good Beer Week. 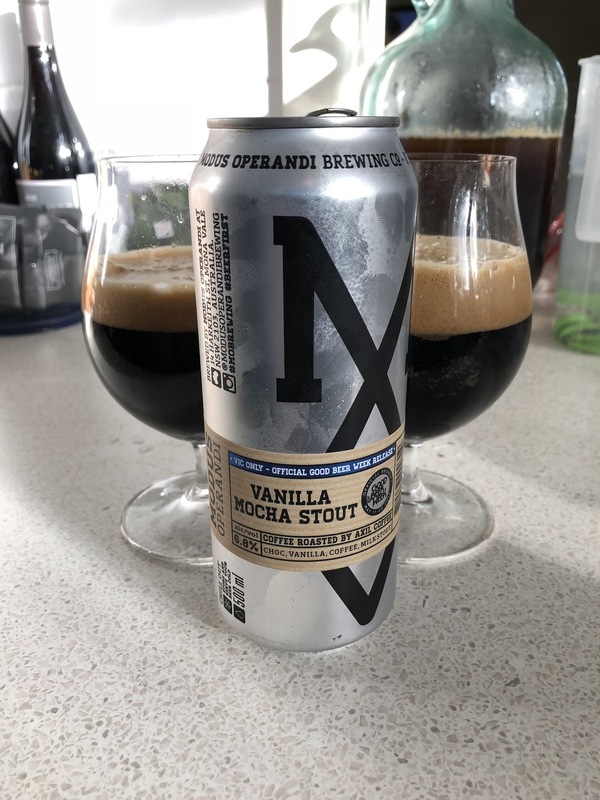 It’s sweet – but not too sweet – with a creamy mouthfeel, full body and a great vanilla/coffee palate that doesn’t overwhelm the base beer. Best Cask Beer - Two Metre Tall Cleansing Ale The beers Ashley produces down in Tasmania are unique. Cleansing Ale is such a wonderful beer and changes every time you have it - due to the nature of what he's doing down there. 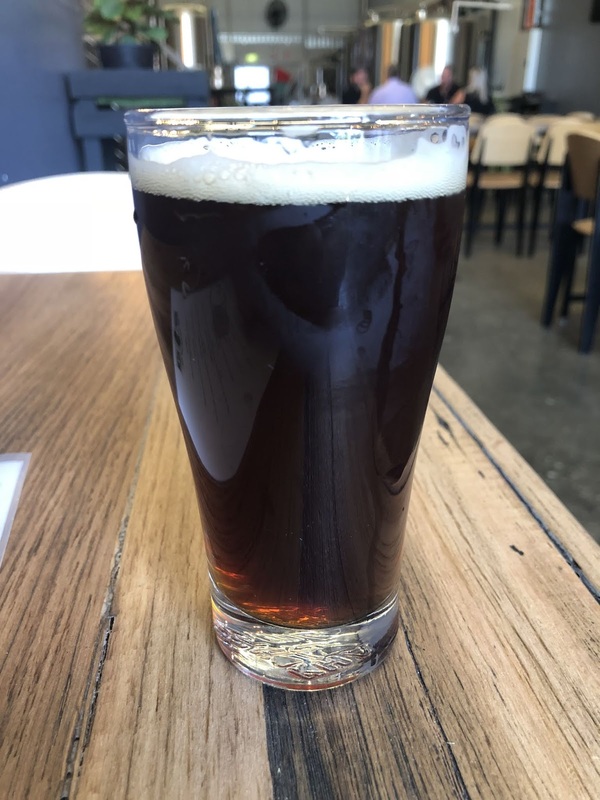 I had this on hand pump at Grape & Grain, it was one of the least tart versions I've had of this beer, which allowed a little more of the underlying malt to shine through. Holgate have that kind of old school appeal that lends itself well to having a rotating cask beer on tap at their brewery. There was a sense of fated timing that I ended up down in Woodend when they had their excellent cocoa/vanilla porter Temptress on tap. 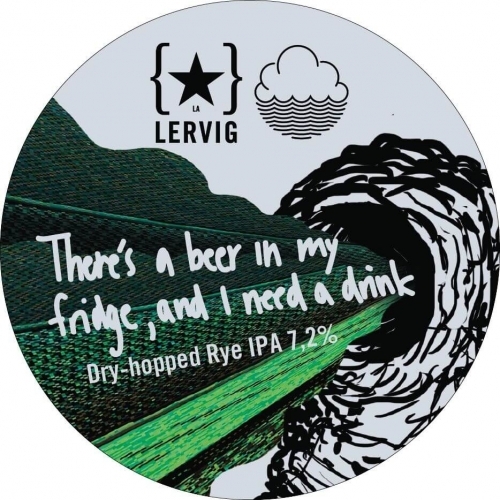 It’s a beer that lends itself wonderfully to a cask pour, with the creaminess receiving a big boost from the format. I drank more cask beer in 2018 than 2017, but I’m still hoping to get that number even higher this year. Best Overseas Draught Beer - Equilibrium Straight Outta the Laboratory This beer was the highlight for me of one of the best events Carwyn has thrown; the NYC Cold Freight Showcase. This event saw Carwyn Cold Freight NEIPA's & IPA's from New York direct to Australia. It was a 10.2% Hazy Triple IPA. It tasted nothing like a 10.2% Triple IPA! It was one of the most dangerous beers I've ever come across in my life! It was like thick tropical juice with a good whack of bitterness. Hill Farmstead were one of those breweries I thought I might never get to try in Australia – of course Carwyn had to make a mockery of that! This was the pick of their beers for me, one that I was lucky to try on a couple of occasions in 2018. It’s such a wonderful example of the kind of world class, wild, farmhouse influenced ales America is producing, with a creamy texture, clean acidity and dry, moreish funk working together in perfect harmony. Best Overseas Bottled Beer - Victory Art Brew Ivan I had a number of incredible bottled beers this years from overseas brewers. I've ended up stumping for this Russian craft beer that I had in an Irish Pub in St Petersburg watching the World Cup. I think it's partly that it signalled the end of a wonderful trip & partly that it's the least well known of the beers I rated highly this year (think Pliny, KBS, CBS, Fatamorgana etc.). It's a huge, smokey stout that hides its ABV superbly. I’d heard a few positive rumblings about this brewery, but honestly knew extremely little going into it. The wonderful bottle art/design and a chance finding swayed me into picking it up and I’m bloody glad I did. There’s plenty of oaky barrel character here, with a sturdy body giving way to intense acidity with off-dry, floral Elderflower notes to balance. It’s the kind of wild ale that could hang with the best in the world, and one that has instantly put this brewery on the map for me. It’s quite easy to be patronizing when talking about NEIPA/hazy IPAs, whether it be due to the inherent limitations of the styles, oversaturation, hype or something else. It’s also quite easy to love a hazy IPA when it’s this good (which, to give Finback total credit, they very rarely are). This is incredibly soft bodied, which allows for the no doubt unholy amount of hops in here to fully shine. It’s big upfront, with a lingering juiciness that most breweries dream of achieving in a beer like this. You’d call the hop character borderline ‘green’, but there’s none of that off-putting hop burn and the beer is balanced enough to keep up with it. 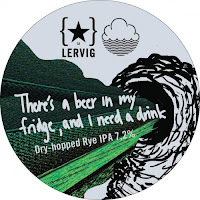 Best Collaboration Beer - Lervig x Cloudwater There's a Beer in my Fridge, and I Need a Drink It was quite possibly the beer with the longest name that I had this year, but I couldn't go passed this collaboration between two of the more hyped brewers on the planet. This is a Double Dry Hopped (DDH) Rye IPA clocking in at 7.2%. It's phenomenal with this rye spiciness underpinning the whole beer, which is laced with resinous dank notes and heaps of mango & peach. Two excellent breweries, a fantastic concept and a special occasion for drinking it made this an easy pick for this category this year. After placing far better than expected in the Merri Mashers IPA competition, this was our celebratory beer. It didn’t disappoint. I love the idea behind it – a raw, un-hopped, un-boiled ale, mashed with peppercorns before being fermented in charred Bourbon casks with wild yeast (hence the name). It’s a surprisingly delicate beer, with zingy acidity and a bit of spice. I love it when a plan comes together. Best Overall Beer - Brouwerij 3 Fonteinen Oude Geuze Cuvee Armand & Gaston Rocking up at Carwyn bright & early for Zwanze Day, there was no thought in my mind that the best beer I would have that day would not be a Cantillion beer. But that is exactly what transpired. This was a simply wonderful beer, particularly complex with wonderful, almost puckering, tartness. I'm so glad that I have one of these aging away in the cellar! Who expects to go to Zwanze Day and have the best thing they drink be a non-Cantillon beer? Not this punter. 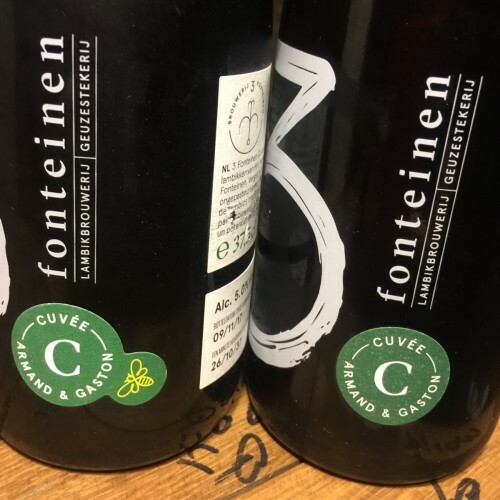 Who could complain when it’s as good as Armand & Gaston is though – a celebration of all the best qualities of lambic beer, expressed through all the skill and craftsmanship that a brewery like 3 Fonteinen can showcase. There’s this wonderful burnt rubber funk underneath the tart, smoky, earthy, full-bodied base beer, with a juicy, puckering character that makes it far more drinkable than the complex flavour profile would suggest. A spectacular, soaring masterpiece of a beer, that I will now stop talking about before I tip too far into gushing. Best Branding - Wayward Brewing I love the look of the new core range, the cans are really striking on the shelf. Shoutout to Co-Conspirators who were only just beaten for the title. They've got a really distinct style that also really stands out. I don’t know if I necessarily love every bit of art or design that 3 Ravens do, but there’s no denying that theirs has been a remarkable reinvention of what was a fairly plain and dull line-up of labels. It, of course, began with Juicy, but they went further than that in reinventing their whole core range and turning the concepts they began with Juicy up to 11 with beers like the Salted Caramel Shake. They deserve praise for being proactive in a crowded market and one can hope it’s paying dividends for them. 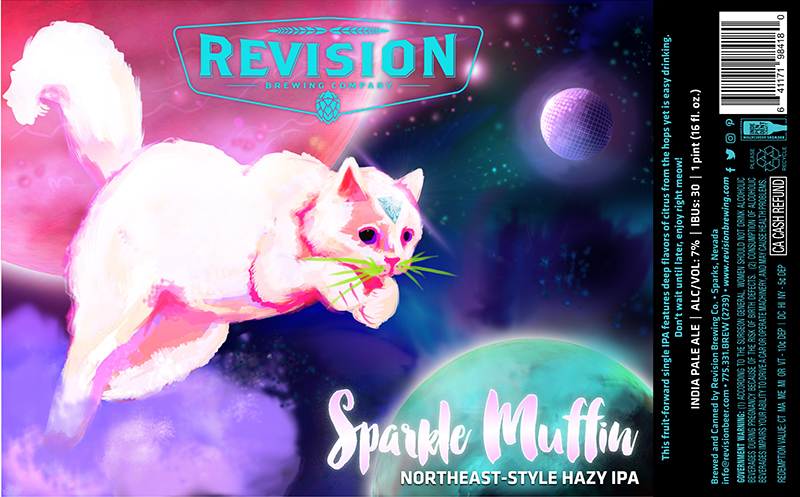 It’s a green whiskered cat leaping through outer space with an LSD colour palette. I couldn’t not choose it. Best Australian Brewery - Old Wives Ales I was really struggling to come up with this one - so as I do, I turned to statistics. In 2018 I had Old Wives Ales beers on 9 separate occasions, and all of those occasions ended with a rating of at least 4 stars. They just got the nod over Wildflower, who I thought I didn't have enough beers from & Fixation. The beer is bloody good, but it’s the whole package of Wildflower that make them so impressive. 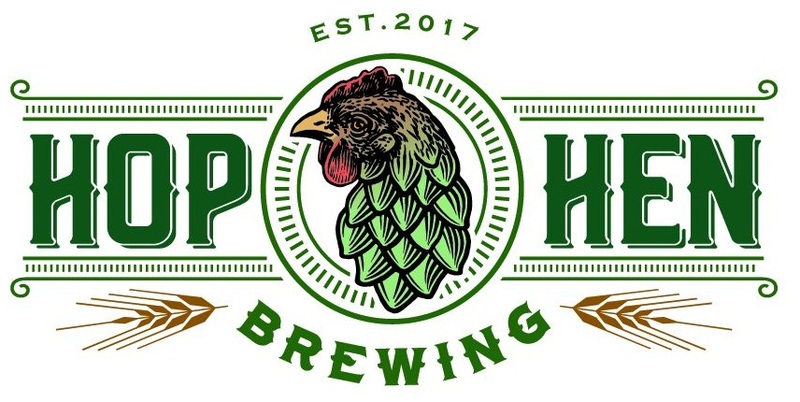 The exciting release schedule, the consistently high quality of their beers, the locally focused mindset of the brewers, the dedication to continual improvement. They’re building something truly special here, and if they continue their current upwards trajectory they’re on their way to being one of the greats in Australian beer history. This feels lazy. It might be a bit lazy. Cantillon are a bit like LeBron in the NBA – everyone knows they’re the best and the product they put out is always close to, if not the best, but it’s more fun to not award them the MVP every year. But this year I feel obligated to. Being able to experience Zwanze Day was a truly special experience, and one of the standout days in what was a pretty amazing 2018 for beer personally. The 2018 Zwanze beer was a spectacular lambic and their regular range remains as wonderful as ever (and would no doubt heavily populate a hypothetical top 10 list of stuff I drank this year). Best New Brewery Opening 2018 - Burnley Brewing Like I do most years, I'm technically picking a brewery that opened right at the end of 2017. They brew the best lager in the country and I've been impressed with their other canned releases. 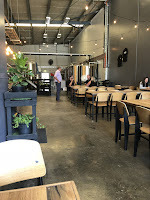 Their tap room is a great place to visit with wonderful food. I reckon Burnley are a brewery to keep an eye on over the next few years. Technically opening in late 2017, Burnley only properly got pushed out in 2018 with their canned releases. With head brewer Michael Stanzel returning to Australia after 7 years training in Germany, there’s a fascinating mix of traditional styles done extremely well (see their Vienna Lager for an example) and well executed new world kettle sours and IPAs at the brewhouse. Their branding is on point, beers enjoyable across the board and overall model showing a lot of promise for the future. I’ll be keeping a close eye on them in 2019, both in can form and at their physical location in Richmond. Pub/Bar of the Year - Carwyn Cellars This is an absolute no contest. Carwyn is clearly the number one venue in Australia, and is slowly making it's way onto the international conscience. It's a genuinely world class beer bar located in Melbourne. As I joke regularly to Dylan, it's a good thing it's in Thornbury not Richmond, I'd have no money if it was closer! Zwanze Day, Good Beer Week, a zillion other things I didn’t get to go to (not to mention their generally astounding taplist, even when there’s no official event on). Carwyn is the beating heart of Melbourne’s craft beer scene and it’s impossible to go past them for that reason. There’s nowhere else I’d rather have a few beers in the country. Beer Festival of the Year - Good Beer Week I'm starting to think that this category doesn't need to exist... Good Beer Week wins every year - and I don't see that changing any time soon! Another one that is impossible to go past. 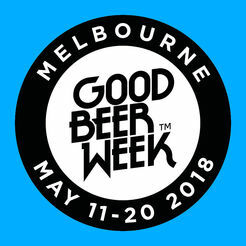 There are some other good events popping up nationally that deserve praise, but Good Beer Week is the gold standard, and remarkably seems to get bigger and better every year. Outside of the events the best part about it is how it galvanizes the whole craft community in the city – taplists get special everywhere, limited releases fill the shelves and there’s a general buzz about beer no matter where you go. It’s invigorating. Supermarket of the Year - First Choice First Choice are retaining their title because they look after their beer better than Dan Murphy's does. I would say that Dan's improved their range more than First Choice in 2018, but it is so tough to give it to them when you see pallets left out in the summer sun for hours & cold freighted IPA's stored on the shelf. Dan’s continue to have a better line-up of craft beer, but the poor treatment of their beer loses a lot of points for me in the 2018 battle. Finding out of date and poorly stored beer isn’t unusual for a big chain store, but it’s happening far too often at Dan Murphy’s stores and leaves a sour taste in the mouth (not the good kind). First Choice really stepped their game up in 2018, with a focus on including more local breweries and a better range of styles (especially sours and IPA varietals). Both chains have a long way to go before we reach overseas standards of mainstream craft accessibility, and a lot of it will come down to better treatment of the product once the stores get it, but there were encouraging signs. 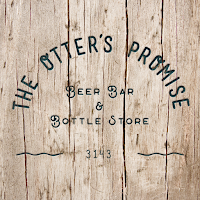 Independent Retailer of the Year - Otter's Promise For me there are 5 choices for this award. 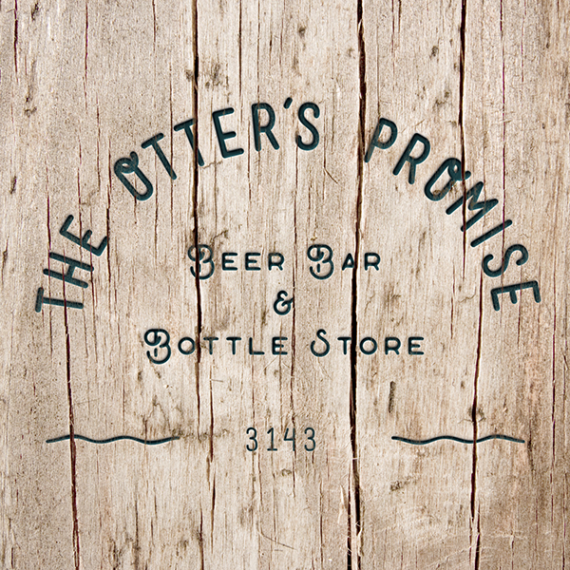 I decided that I should award it based on the shop that I visit most often to buy beers; meaning that the 2018 winner is Otter's Promise. Otter's has a really great range, which caters for whatever you need whether you're after a 6-pack of lager or a $70+ Imperial Stout. I did genuinely consider Beergeek in St Petersburg, who gave me seriously good service on my 2nd last day in Russia! Otter’s have such a reliably great line-up of beer regardless of mood. There’s a wonderful ambience in the store, welcoming and spacious with varnished wood and exposed brick while also remaining cool and concise. They get limited releases in consistently and have one of the better ranges of wild/sour beers in Melbourne at any given time. It’s all I could really ask for in a beer store, and it’s a great place to have as a local. Having a few taps is a good addition too – their birthday sour blend with Boatrocker was a cracker. Online Retailer of the Year - Schmooze Craft Beer Subscriptions The rebranded online subscription arm of Carwyn Cellars, Schmooze is impossible to beat for service and reliability. I had an issue with a delivery after changing addresses earlier this year & the guys were so obliging (& threw in so many freebies) to get it sorted. They've got a heap of different options now and I can't recommend them highly enough. I’ve had my criticisms of Beercartel in the past, but my experiences with them in 2018 were all of a high standard. Fast shipping, with products arriving in good condition. A solid and diverse range, with some genuine good scores to be had (in 2018 I got Cantillon, Fantome, de Molen and Stillwater releases from them, amongst others). The ‘notify me’ feature is great too, and unlike a lot of websites actually works, immediately alerting you when something is in stock. Best Beer Book - The Oxford Companion to Beer I didn't read a heap of beer books in 2018 as it was such a busy year. So I've reverted to a book that I look at all the time. Garrett Oliver, of Brooklyn Brewery fame, helped to compile this book. In my mind it's the ultimate beer reference book. Best Beer Magazine - Froth Froth really evolved in 2018. I think the free monthly craft beer magazine has really found it's niche, particularly in the Melbourne craft beer scene. I look forward to receiving it every month and am looking forward to what Emily & the team get up to in 2019. The inspiration for one of my favourite canned sours of 2018 (Co-Conspirator’s The Editor), Froth has gone from a fun novelty to a genuinely good read. The diversity in articles with a monthly theme is really what makes it compelling – women in brewing, cooking with beer, homebrewing, state by state news/big releases, science-based articles, new hops and trends. It’s all good stuff, with a nice range of writers from different sectors of the Australian craft beer scene. Great design too. Best Beer Blog or Website - Australian Brews News I'm actually giving this award to Brews News for their excellent weekly podcast. I listen to it on the way to work religiously on a Monday (now-Friday!) & love catching up with the weekly news from the Australian brewing industry. I'd like to give a shout out to The Crafty Pint for their long form articles this year, that really encouraged a lot of discussion on social media. I loved The Crafty Pint’s focus on broader issues this year, with some great pieces on topics important to the industry (alcoholism, selling to macros, sexism, copyright etc). 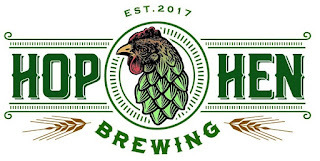 I especially enjoyed their deep dives into Pacific Ale and Hop Hog as they reached age milestones. 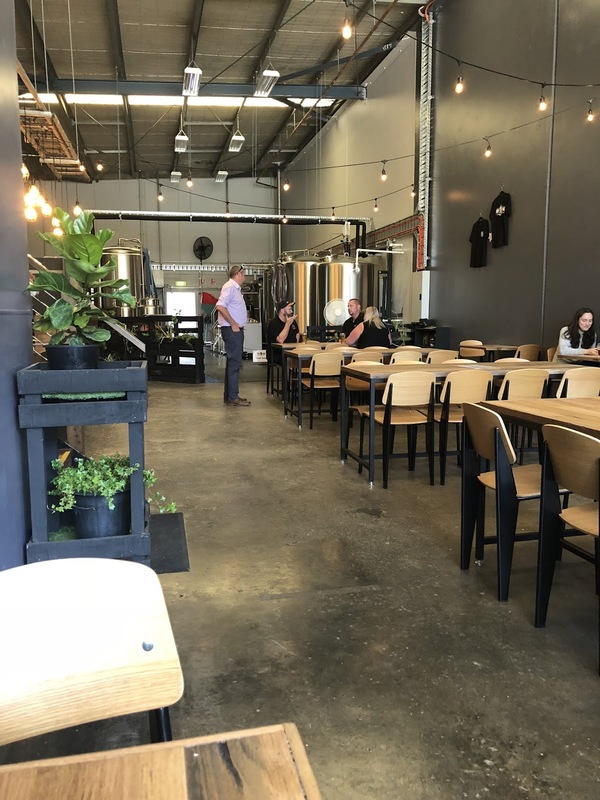 Their continued coverage of small/new breweries on a personal level is a great approach to take to compliment the blander news/marketing coverage on other sites. They’re a great website who had a strong year, which makes them an easy pick in this award. I'm sorry that this is as late as it is - however life really got in the way this year! As is often the case there were a couple of cross overs between mine & Dylan's awards. This is purely coincidental & probably because we attend a lot of events & drink a lot of beer together. I've just sorted myself out with a new laptop, after over 10 years, so technical difficulties are hopefully a thing of the past. My week is looking relatively free next week so I'm hoping to bang out a heap of Year of Local posts - so stay tuned guys! These guys are one of the reasons I wanted to start this directory of Victorian brewers. Despite Three Greens being around since the middle of last year I'd never heard of them - if I haven't heard of them I wonder how many others haven't either. This is my way of giving back to the local industry that I love so much (possibly too much?). 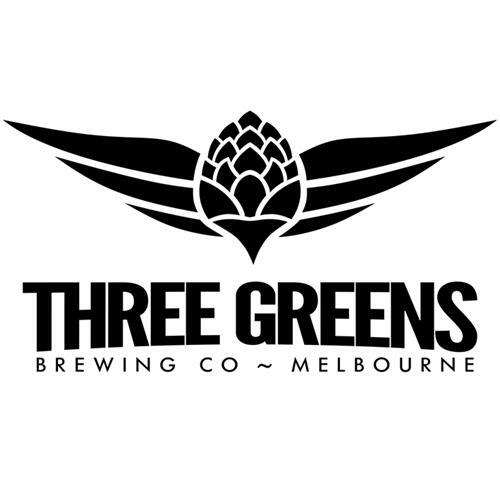 Three Greens Brewing Co launched their first beers into the world in the middle of 2018. The company has a similar story to many I've heard; individuals enjoy home brewing, like minded individuals meet, shortly thereafter they start a brewery. That seems to be the story for Nick, Luke & Julien who met through their other shared passion, aviation, which doubles as their day jobs. 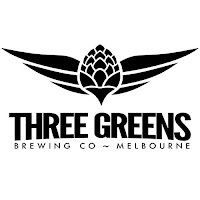 For those who aren't aware their brewery name, Three Greens, is a reference to their day jobs. Airplanes aren't able to land unless they see the three green lights indicating that the landing gear is safely locked into planes. The fact that there are three brewing partners is entirely coincidental, although it is a nice touch! This year the guys are looking to continue to grow their business in 2019, by expanding their core range and release as many special releases as they can. 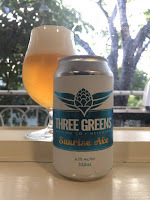 I was able to get my hands on their Sunrise Ale, so that's the beer I'll be reviewing for The Year of Local. It's a 4.5% Pale Ale that utilizes Cascade, Simcoe & Citra hops - a promising start! The beer pours a medium gold colour, whilst there is a thick white head sitting atop the liquid that lasts, at least in part, for the duration of drinking. The nose is very mild with a bit of caramel and biscuit malt the only thing really jumping out at me with very little hop character present. This however didn't translate to the taste, which combined some citrus and fruit notes with the malty notes. I was surprised to see rice in the grist, it tastes full bodied so I'm not sure what purpose it is serving as they obviously aren't using a heap of it... All in all, it's a really well balanced Pale Ale & one that I would quite happily drink again if offered it.